Yesterday I found myself in Devon and, I’m not going to lie, the trip was arranged with the primary purpose of seeing more lighthouses. Would you expect any less? The reason Devon was chosen, however, was because Bob was in the area for work. Our first journey of the morning took us to Plymouth where we were able to get a view of the lighthouse on the breakwater from a distance. Visibility wasn’t great when we arrived and it continued to deteriorate rapidly once we had parked up. It was fairly windy and rain clouds were forming, so we did exactly what any normal people would do and took shelter in a lighthouse! Smeaton’s Tower sits on The Hoe in Plymouth and currently serves no typical lighthouse purpose in its current location. It originally stood on a dangerous rock 13 miles off of the coast of Plymouth. The structure was replaced, however, in 1882 when the rock on which it stood began to crack. The top section was removed and the base still remains in position alongside the current tower, Eddystone lighthouse. 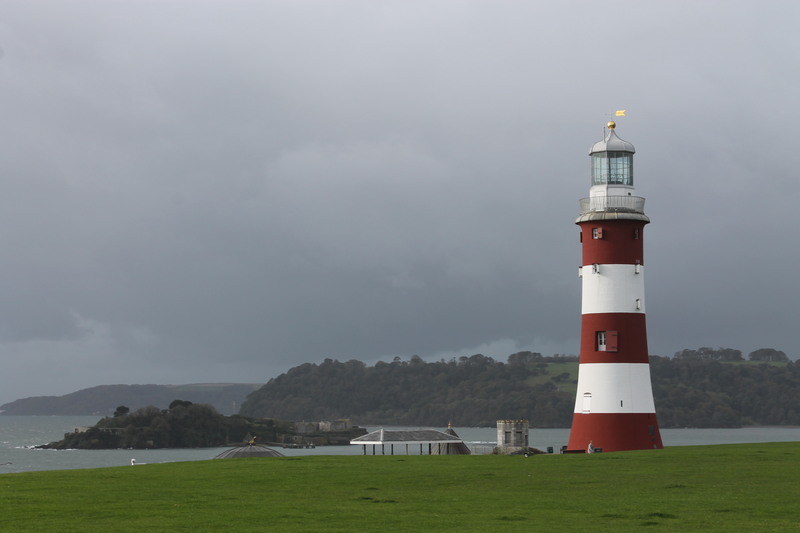 Self-guided tours of Smeaton’s tower cost just £2.50 and you can walk right to the top and, even when it’s windy and raining, they let you go out on the balcony just below the lamp room! Being in the lighthouse in the wind and rain was great, although it didn’t look like a particularly comfortable home for the former lighthouse keepers! I would definitely recommend a visit to the tower to anyone and, if a cup of tea (or hot chocolate with marshmallows) is your thing, you can make a mad dash to the nearby tea room in the rain, just like we did! After a quick stop to look at a nearby beacon and before heading further around the coast, we took a detour via Kit Hill, which is south west of Tavistock. Kit Hill is what is known as a “Marilyn”. A Marilyn is a mountain or hill with a relative height of at least 150 metres (492 feet) and Bob has now “bagged” around 730 Marilyns across the country. Kit Hill was on his to do list, so while we were in the area we popped up. When I say “popped up” this is essentially what we did. There was minimal climbing involved, just a single track road that took us near enough to the top in the car and then it was a walk of around 1 minute to reach the trig point at the top of the hill. This is my second Marilyn and, I must admit, it wasn’t quite as easy as the first (St Boniface Down on the Isle of Wight) where I could touch the trig point without even leaving the car. Apparently, we are building me up to those where you actually need to put in a bit of effort! So, back to the lighthouses and our next stop was Start Point. The lighthouse is located on the point as far south as you can go from Dartmouth. On the way there we stopped off for an ice cream (of course) and while we ate them in the car it rained and then the sun came out. I believe my exact words to Bob were “Oh look, you made the sun come out. Did you bring a rainbow as well?” and he turned around towards the sea and pointed to a rainbow (amazing!). Not only was it a rainbow though, it became a double rainbow! Anyway, we continued on to Start Point lighthouse, which was, unfortunately, not open yesterday (tours are run some days, weather-permitting), but we snuck into the grounds and got some photos. It was a nice walk from the car park down to the lighthouse with some great coastal scenery. The weather had also begun to pick up by this point. Berry Head was our next stop. The small lighthouse (so small that it consists of just the lamp room) sits on top of a cliff just south of Brixham. It’s a very cute little thing and I managed to convince Bob that he didn’t want to trespass to get a closer look as we hadn’t paid for parking in the car park (that works, apparently)! Brixham breakwater was then a short drive away and we took a stroll along the breakwater to the lighthouse at the end. Our final stop of the day was Teignmouth. By the time we arrived it was getting dark and we were fortunate enough to see the light on. It’s a constant red light, which I pointed out doesn’t go so well with the blue at the top of the lighthouse, but that’s obviously not important. The structure has a really interesting feature around the tower: bicycle wheels with colourful spokes on them. 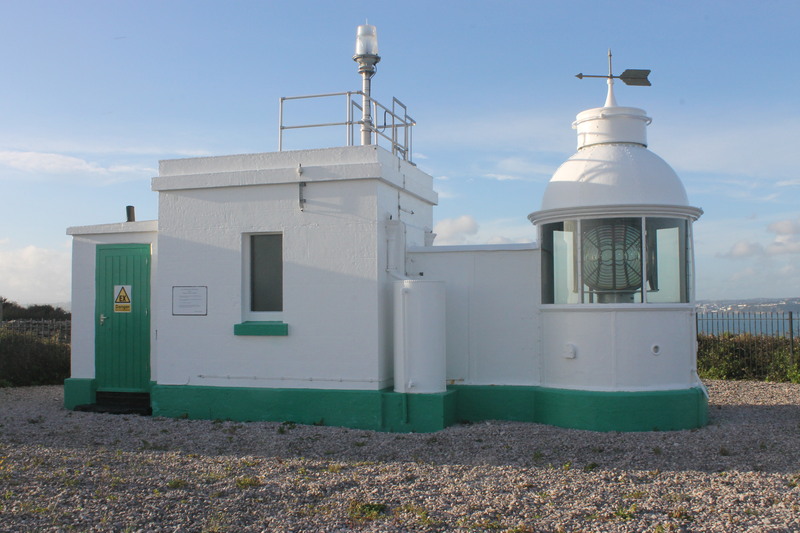 It is a little odd, but adds some personality, which is often missing from lighthouses these days.